Chez Clarisse is a spot located in the heart of Osu. Do we sound like official tour guides or nah? 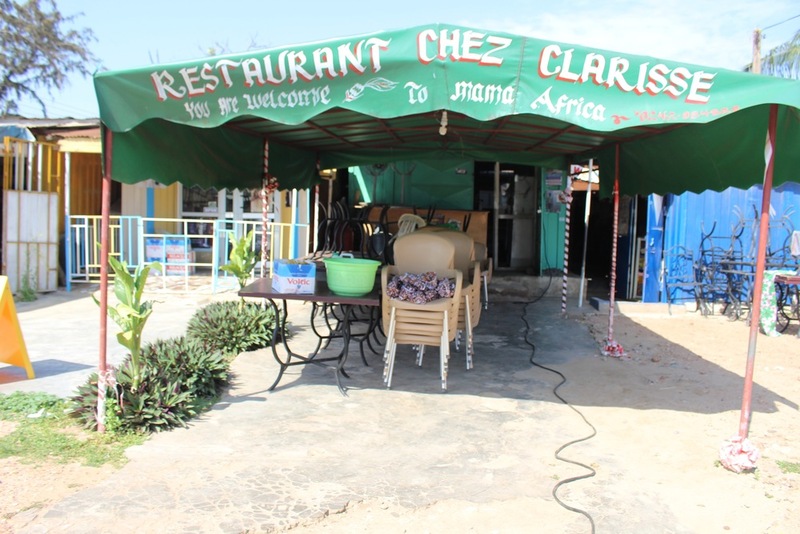 Chez Clarisse is an Ivorian chop bar basically off the SSNIT backroad between Venus and Dynasty Chinese Restaurant . Honestly speaking, Google maps will give you better directions than we can. Dede: I wonder how Google maps is going to work with all these new road changes. I'm looking for the person who came up with the names, how come East Legon is named after flowers and Tesano is named after stationery items? We want answers. Ash: For the corner that Chez Clarisse is hidden in, the google maps directions are quite accurate for this location, which tells me that a lot of expats/foreigners patronize Chez Clarisse. I can definitely see the appeal. It is not a restaurant but I’m not so sure they are a chop bar (as Dede refers to it) just yet, the inbetweenness of the location (particularly the exterior) gives the impression that one is indulging in an authentic African experience. So again, I see the appeal. Dede: Chez Clarisse is a chop bar. They've been working on their hard copy menu for maybe 2 months now. I can't wait to finally see the final copy seeing as they've taken so long to get a hard copy, I think the ink will be gold plated. So for now the menu is in the waitress head and they have 6 things on their menu. That could fit on half of an A4 paper so I think they are trying to save the planet. The menu is grilled chicken, grilled tilapia, attieke, plantain and jollof. Ash: I actually had the pleasure of witnessing that menu; quite extensive it was and definitely no gold plating in there. But the available food items were down to the six items Dede mentioned. Perhaps that’s why they didn’t offer you the menu. Dede: I love the food at Chez Clarisse. First of all the food is super cheap, in this economy with Christmas coming and me signing up for multiple secret Santas, cheap is the way to go. The food is super tasty as well, well everything except for the jollof please stay away from the jollof. I believe that's what Nigerian jollof tastes like, it was so mushy and made up of large grain rice and tastes like rice and tomato sauce. It's not good. Ash: My lunch date referred to the jollof as subpar, and even though I called him mean, there is no better description for the Chez Clarisse jollof. It is not Ghanaian jollof. Honestly Ghana wins in this jollof game every single time. Dede: The attieke, grilled tilapia, grilled chicken and plantain on the other hand is something to write home about. The grilled tilapia is well seasoned and the grilled onions and tomatoes add extra flavor. Please remember to pack a toothbrush or extra strong mint because your mouth won't be smelling too cute after this meal. Ash: I didn’t love the food as much as Dede did. I think it may have been all the hype about Chez Clarisse that left me a little less than excited about their food. Was it tasty, yes. Is it the best Tilapia in Accra, in Osu even? The answer is nah uh. no. Thier food is tasty and glorious to look at and what I loved most is the serving size to price ratio. Chez Clarisse be plating for you and the whole fam yo! But I wasn’t rolling over and jumping about their tilapia and definitely not about their chicken. Ash: I’m not sure what attieke your friend has been eating but attieke is a lot more like gari than couscous, taste wise. It has that almost sour tangy gari/kenkey taste and is alot more grainy than couscous, which is very fine and light. The Attieke you describe sounds about right, and for me the attieke was cooked to perfection, and as a Nzema babe, I should know, or? I think Roots (Du Bois centre) plates some really amazing attieke. The sauces that accompanied the attieke weren’t as yummy as I would have liked them to be, so I gravitated more towards using the tilapia sauce to eat my attieke. Dede: The plantain was just how I like it, soft and spiced with only salt. The chicken was also well flavored with onions and tomatoes garnishing. The best way to eat at Chez Clarisse is one with your hand, they don't even provide you with cutlery. Remember you are in a chop bar and two by combining the fish, plantain, attieke, green pepper and stew in your hand. It's so good, so many good flavors at once. Ash: For the price and the speed with which food is delivered Chez Clarisse plates some pretty decent food. Would I go there for my birthday, never. But will I pop in on occasion for a quick meal, without hesitation. It’s definitely making my list of places one must try out in Accra. Dede: The only drink I know they have is sobolo and water. The sobolo is actually very yummy, it can come out very sweet for the grandmas and grandpas out there but that's why their next option is water. I enjoyed the sobolo and got one to go. Ash: The sobolo was still hot when I arrived so I was on water struggle bus throughout my meal.